When you’re sharing working quarters with some of the most brilliant technical and artistic minds ever, everyone has a wish list for what they would like to see the site’s technology do. That’s where the fine folks of JibJab’s product department comes in. 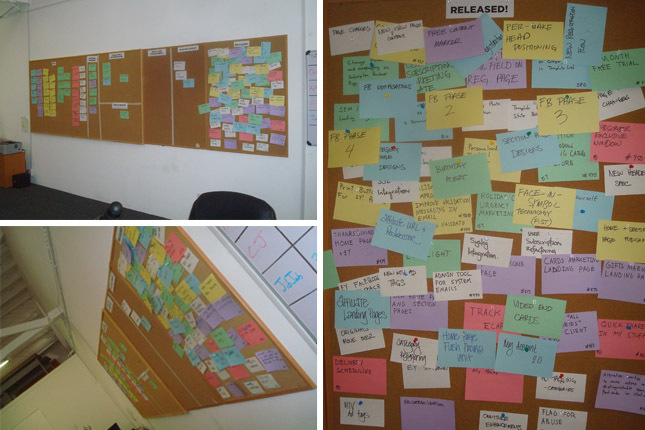 They collect and organize every request from employees and users into a massive bulletin board that takes a concept from idea stage, to upcoming on the roadmap, through the collection of specifications, past a ready for development phase, into development and finally declaring the update released onto the site! As you can see, there is something always in motion, making it’s way from the “idea” side of the board to the “released” side of the board. We can’t show you our list of ideas, but you can see our massive stock pile of completed release cards! It’s beautiful to look at isn’t it? This entry was written by paulhanges and posted on September 3, 2009 at 5:08 pm and filed under Inside JibJab. Bookmark the permalink. Follow any comments here with the RSS feed for this post. Trackbacks are closed, but you can post a comment. Do you use off-the-shelf software for your animations, and if so, which packages? Alton – Please take a look at all of our Behind The Scenes posts, including https://blog.jibjab.com/behind-the-scenes-the-making-of-hes-barack-obama/, and you’ll be able to see *everything* that goes in to the making of our animations. Ever thought of putting some Talk Like a Pirate Day ideas on this bulletin Board? I was making a card for a friend on facebook. When my friend list came up she was not on the list. How do I get her back on?